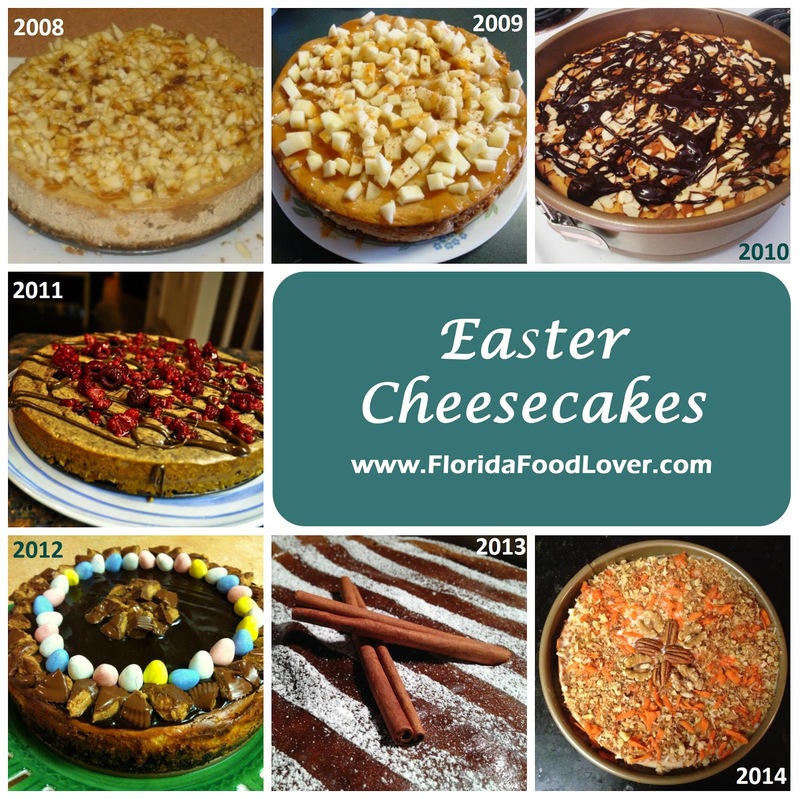 Since 2008, I've had a tradition of baking a cheesecake every year for Easter. It started when I was in college – we didn't get a long weekend for the holiday, so I’d stay up in Gainesville and celebrate with my friends. Those first two years I made the same flavor – apple caramel using this recipe. In 2010 I decided to switch it up and try out this amaretto cheesecake. It came from the book Cheesecake Extraordinaire – the recipe is outlined here on Melinda Lee’s food blog – but I added more slivered almonds to the top. After that, I kept up the tradition with my family. In 2011 I made a chocolate raspberry flavor (and at that point I had a better camera too!) I followed this recipe from Cuisinart, but tweaked the crust to be a bit thicker by using 1½ cups crushed pretzels, 6 T butter, and 4 T brown sugar. I also added a drizzle of chocolate and fresh raspberries. The next one in 2012 was super decadent – chocolate peanut butter. It was adapted from this recipe from Taste of Home, but I added some crushed pretzels to the crust and decorated the top with Cadbury mini eggs. Just a small sliver of this one was a total sugar bomb. 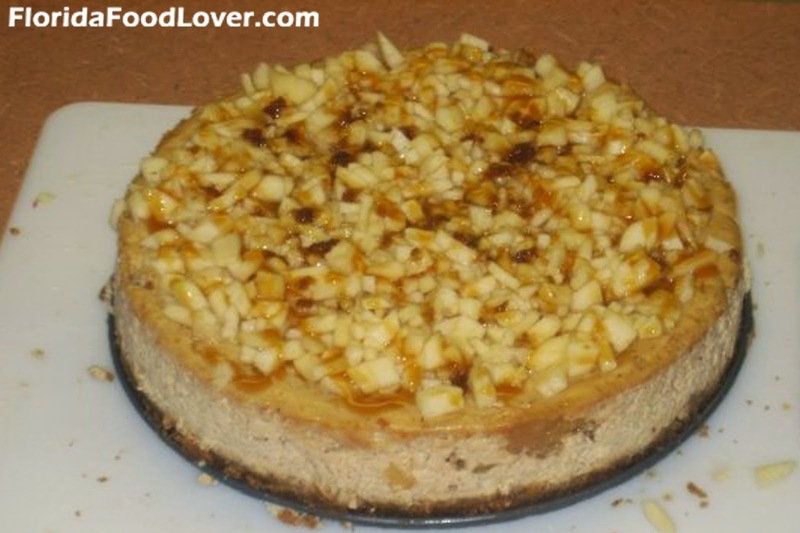 In 2013 I made a pumpkin spice latte cheesecake adapted from Sprinkle Bakes. 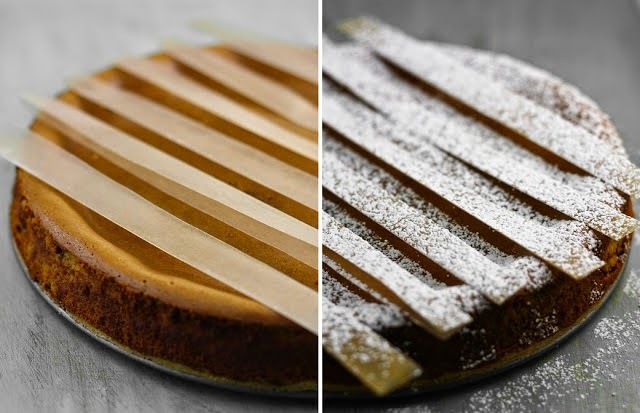 If you plan to top it with powdered sugar stripes, make sure to do it right before you serve it, otherwise they will just soak into the cheesecake and disappear. It was really easy to add the stripes and made it looks super fancy! Just cut strips of parchment paper and lay them over the cake, then dust sugar over. 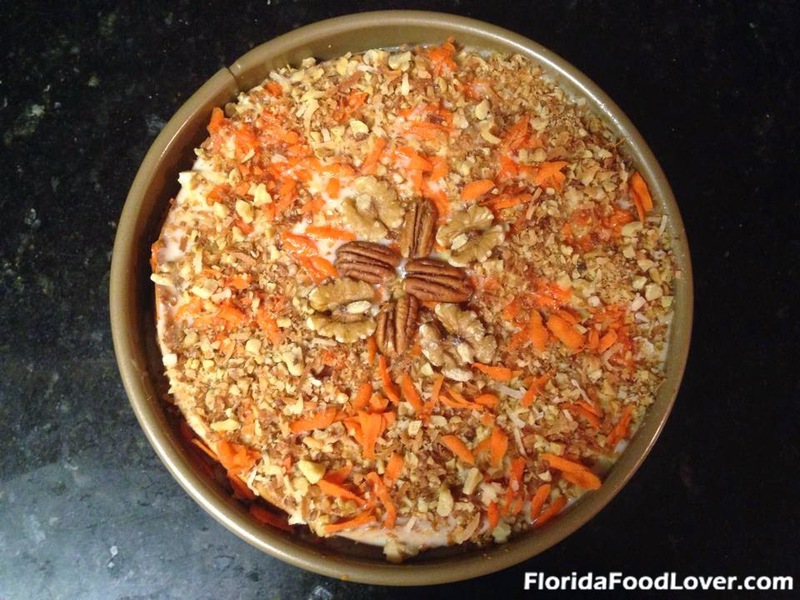 Last year in 2014, I made a carrot cake cheesecake, which I think is my favorite yet! It was adapted from Secret Copycat Restaurant Recipes – which copied it from the Cheesecake Factory. Carrot cake is my favorite – especially with cream cheese frosting. I added some shredded carrots and chopped walnuts to the top. The crushed pineapple kept the cake nice and moist. I’d love to just repeat last year’s recipe again – but I’m trying to bake a different flavor each year. Lance’s sister Brandi and her husband Jeremy will be in town from Idaho this year which will be exciting! Any suggestions for what kind I should make this year?